When installing Xubuntu 14.04 Beta 1, the ubiquity background is a wallpaper with the debian logo. I saw this too. I will also note that if I go into "Try Xubuntu" the background is what I expect (no Debian swirl background). I didn't see this yesterday following the testcase - ie using Try Xubuntu and then installing. 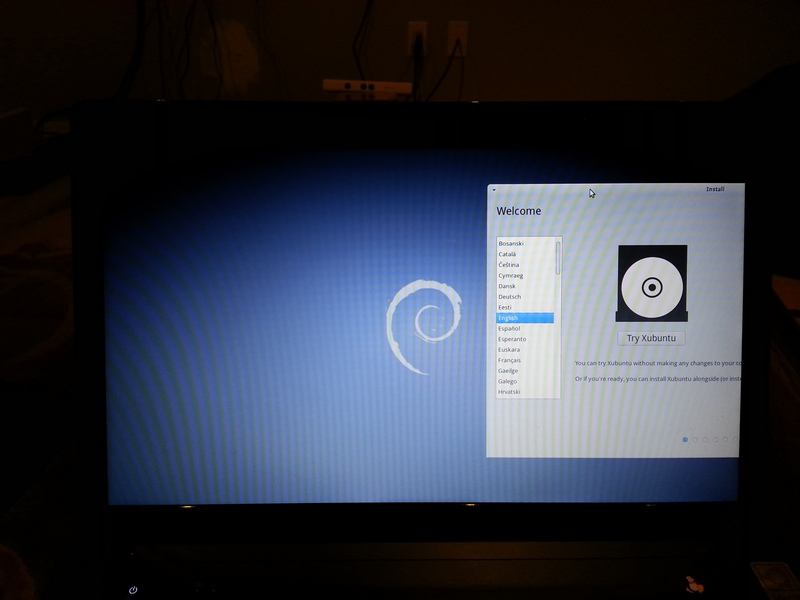 Installing directly today - saw the debian wallpaper. It pops up on the screen where you select Try or Install, so following the testcase you should see it at least on that screen before going into the Live session. See attached, I moved the dialog out of the way to show the background. Most likely a bug in ubiquity-dm w.r.t. how the background is selected/painted. So would you say this is related to the changes in rev 6044? * Set default wallpaper key for gsettings based applications, e.g.